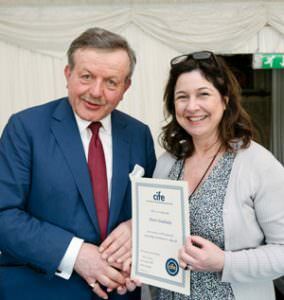 We’re delighted to report that two Collingham students received CIFE awards this year. Alexandra Young won the 2017 Baroness Perry Award, and Davit Endeladze received a College Award for his exceptional contribution to life at Collingham during his time with us. When multi-talented Alex Young joined Collingham in January 2016, she decided to take Art A2 from scratch and in just six months she achieved an A grade. Alex’s work is edgy and haunting. Her portraits are reminiscent of the work of Francis Bacon and are currently being proudly exhibited by the college. This year, Alex has won the top award, the Rector’s Prize, in the Young Art at the Royal College competition which attracted 7,500 entries. Alex will read Liberal Arts at Bristol University in the next academic year, but was so enthused by the Art tuition she received, she has not ruled out pursuing an artistic path in the future. She is currently working as an intern in Madrid. Davit Endeladze was educated in his native Georgia before coming to Collingham in 2014, and his A level grades are all the more impressive for having been achieved in a foreign language, after just two years of study in the UK. He achieved A* in Maths and Further Maths, an A in Physics and B in Economics. Davit is now reading Physics with Theoretical Physics at Manchester University. Neither student could make it to the awards ceremony this April but we were delighted to receive the awards from Lord Lexden on their behalves.